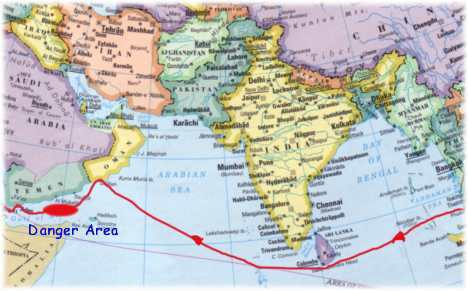 Many cruisers consider the Indian Ocean to be a 'milk run', gentle trade winds all the way across. We found it to be more challenging with light winds at times and on the nose at others - but never dangerous. The new cultures were interesting and at the end we were in the volatile Middle East. This has been an introduction into new cultures: Indian, Arab, and truly Muslim. And as usual, we have found the people to be friendly and inquisitive as long as we respect their customs and culture. In the 3000 miles across this ocean we motored a lot and are glad to have 2 of the big 3 oceans behind us. 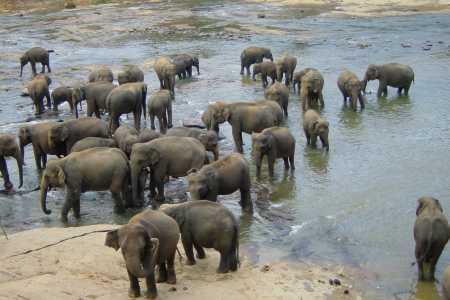 A 9-day sail from Thailand, this fascinating land, that used to known as Ceylon, was beautiful!. Most cruisers stop here on their way to the Red Sea, although the more adventurous would press on the Cochin, India or the Maldives instead. The country is a little seedy due to a low standard of living, but the water at the port was potable, the food was good, and the people are nice. The highlights are tea plantations, temples, and elephants. Officials take advantage of their position by trying to squeeze 'gifts' out of us, but they accepted it when confronted with a polite 'No'. We toured the countryside, so check out our experiences in Sri Lanka. This string of islands 500 miles long lies across the route to the Red Sea. They are beautiful, reminiscent of the South Pacific islands with white sandy beaches, swaying palms, and warm breezes. The capital, Malé, in the middle of the string is out of the way for yachts in transit, so cruisers are now stopping at Uligan, the northern-most atoll. We stayed there for a week, stocking up on a few items and absorbing a little about this Muslim culture in the middle of an ocean. Check out our Maldives page for more details. This was our first Arab country - and we were delighted! Oman has oil, and the enlightened Sultan appears to have used much of the wealth wisely as the infrastructure is good - wide, smooth roads, clean water, well-dressed and proud people, and well-educated youths from what we could tell. 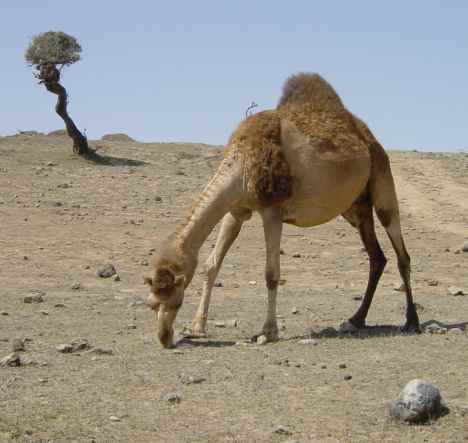 The abundance of camels reminds you that the desert is near and that many still live rural lives. The people were really friendly to us - although relations cooled a little when the US started bombing Iraq. The Oman page has more information. Sea stories about piracy at sea always seemed distant - until now! 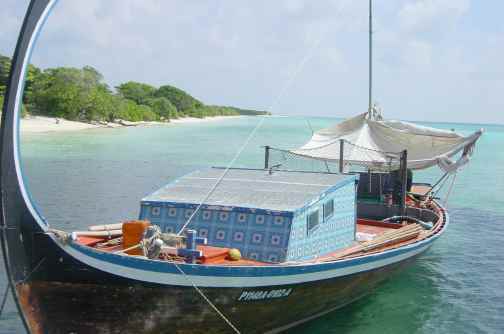 In the week before we had to transit the Gulf of Aden two yachts on our radio net were attacked, one boarded and robbed and the other one merely shot at. We started calling the area between Yemen and Somalia the Danger Area. We took copious precautions by hiding items of value, setting up contingency plans, traveling in company with another yacht and at night. Either luck or precautions worked and we made it through unscathed and much relieved. Our Journal page for March 2003 has all the details, plus a real-life account of a pirate attack. We had heard many negative stories about this war-torn country, and the fact that a US warship had been bombed here a year earlier put us off a little, but we are glad we stopped. The people (as usual) were wonderfully friendly. We engaged a driver/guide/advisor for 3 days and Salim made our stay memorable. He showed us the highlights of Aden, took us to restaurants and helped in many ways. 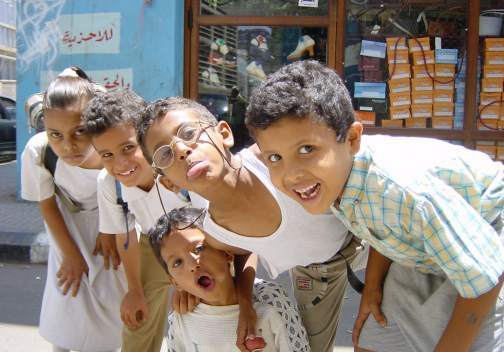 Our Yemen page tries to capture the highlights of this fascinating country.